The eyes of English men scan the sky uneasily today. For on this jewelled island we are still haunted by a thousand-year legend, a shred of ancient story which concerns that most merciless of Anglian elements: the rain. St Swithun is commonly known for this one thing: that he wanted to be buried outside, his stone open to the sky, where people might walk over it every day. It seems Swithun cannot have been a solitary man. He craved the feet of pilgrims and tourists to keep him company through eternity. I have some sympathy with him. Outside is natural: inside is so often man-made. Outside is open: inside enclosed. If one cannot get up like a revenant from one’s grave and walk again, why, then, at least one can sense the vitality of the living and the light of a mellow English sun. How furious he must have been, then, when the monks of Winchester moved him inside. He was attracting increasing numbers of pilgrims, and wresting the maximum amount of money from a pilgrim required enclosure. Now that Swithun was inside the monks had sole control of who could have access to the saint. The day after he was moved there was a great clap of midsummer thunder; and then, it began to rain. It rained for forty days and forty nights. And even today, if it rains on St Swithun’s day, we fear it will hail a deluge here in England. They do not tell you the postscript to the story: that monks made the same decision to bring Swithin in. Bishop Aethelwold had some very convenient visions, in which he was told in no uncertain terms to transfer Swithun inside. His subsequent post-mortem history is complicated. It includes many moves; his head made its way to Canterbury Cathedral, and his arm to Peterborough. He was moved inside the new cathedral in 1093, and the shrine moved numerous times before Henry VIII’s dissolution had it demolished. His original grave was excavated in 1961. But St Swithun was nowhere to be found. 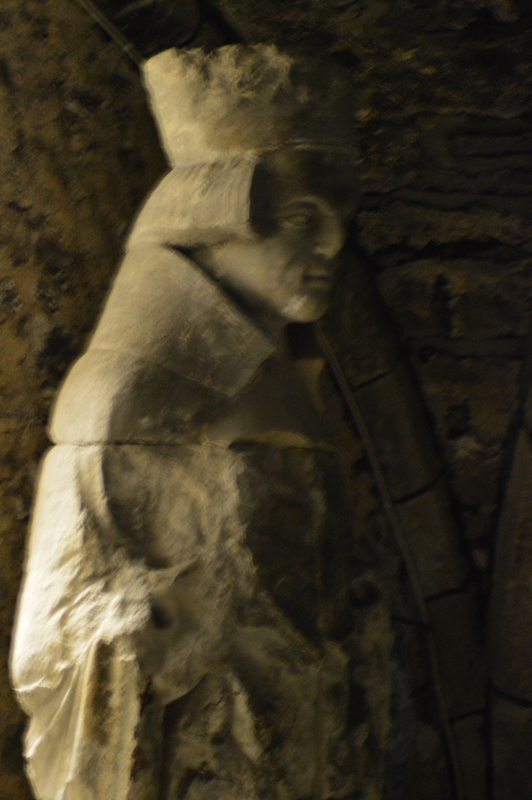 Deep in the bowels of the Cathedral Crypt, though, his statue and sepulchre stand in the shadows, far from the sun. Perhaps Swithun is to blame not just for freak meteorological occurrences, but for a whole climate. If we put his baggage back into the sunlight, would we become Mediterranean? May the sun shine on you – and us- today. Posted in Quirks of HistoryTagged anglophile, england, rain, St Swithun, stories, Winchester CathedralBookmark the permalink. Alas for poor St Swithun and his fans, the British climate wasn’t Mediterranean before his demise — unless we count the distant geological past. It’s a great story though, and I was anticipating something on this from you after a recent post or two on Winchester, so thanks! Hi Chris: despite Googling, I still have no idea which day the film refers to….I love the link with Bastille Day. Sorry if your Googling left you none the wiser! From Wikipedia: “One Day is a novel by David Nicholls, published in 2009. Each chapter covers the lives of two protagonists on 15 July, St. Swithin’s Day, for twenty years.” The screenplay for the film was also by Nicholls. But I’m glad you liked the Bastille Day link! Ah, now I have to watch it. Thanks! here’s hoping he relents and gives you all a balmy day, sun, gentle breezes and no rain! It has been a lovely day today, Sidey: not a drop of rain. Here’s to a long, dry Summer. I love olives. Perhaps all the olive- haters might move to the low countries, thus causing a welcome fall in property prices. Sounds like a win-win situation to me. Incidentally, for the first time ever, last Winter, I was able to overwinter my favourite geranium outside. Spooky. That would give me just one more reason to emigrate to Europe! If America wasn’t so jam-packed with the sublimely interesting, Rob, I’d counsel you to be on the next plane here. Washington and Charleston for us this Summer! Mm you’re going to visit Andra, yes? I bet that’s going to be loads of fun! Mother was stationed at Winchester in the early part of the war and was shown all over the cathedral by one of the vergers…she was quite surprised to meet St. Swithin having no idea of his connection with Winchester…but I think was more interested in the memorial to the diver who played a major part in remaking the foundations which were waterlogged. Ah, yes- splendid chap. And what a life- diving into the murk under the cathedral to shore it up! I’d love to know what the fascination with building holy places on water meadows was. I’ve just learnt that Salisbury Cathedral was built on them too. It makes me wonder about land use changing over the centuries…were water meadows always such? Better than being put not just in one box, but innumerable ones, Nancy! The very thought! Ah, the thunder is due at the end of the week, coinciding with the beginning of the school holidays, Penny. Hope the weather down your way improves! Yuck. Poor man. Strengthens my determination to be cremated. Proof that no matter how much we plan and make our wishes known, we lose control with our dying breath. No wonder he makes it rain.